The delight of an historical fiction children’s book is that it can bring a period of history alive that you know nothing about. This exposition on the only female pharaoh of Egypt will delight you. It is almost too good to be true– the way she manages to get to the throne, and then hold it at all costs. Coming on the heels of an historic election, where a woman still did not break a political glass ceiling, it is interesting to go back in history and understand more about the obstacles women faced hundreds of years ago. 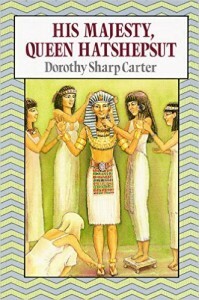 I had no idea there was a woman pharaoh, that she ruled fairly and well, but that an entire culture could not accept a woman as a leader. Forced to reign with an incompetent male son, simply because she was female and he was a male, sounds unbearable. How long has this duality of gender respect been going on? Since the Garden of Eden, I suppose! In any case, not to get political, I do think this historical fiction children’s book is a perfect one for children to read at this time. In the Waldorf curriculum, we do teach about ancient Egypt. Bringing the feminine side into the classroom as well will do a great service to every child. Reading this children’s book home could spark interesting conversation.